I’m really sorry about the last couple of weeks – I did about half the analysis of the race for Malaysia, and I didn’t get the chance to do anything at all for Bahrain – but I did discover how the fuel consumption at a circuit can affect the competitiveness. In Malaysia, there was no sign of fuel saving from anyone, and in Melbourne there was fuel saving from all execpt Williams clearly visible in the race history chart. Bahrain’s competitiveness was not all about power and straightline speed. The higher fuel consumption than Malaysia came into play again – which meant that the Mercedes powered cars were again at advantage, and especially the Williams looked better again. I was surprised in the Melbourne analysis that Bottas had not looked particularly quick when the data was fitted – but it is clear now that this was because he wasn’t that quick. He gained huge amounts whenever everyone else went into fuel save mode. In China it looks like the Mercedes fuel efficiency advantage will be less than in Bahrain – indeed the Friday practice looks to be at least as close as we have seen this year, although the inconsistency of the pace makes it less clear than usual. 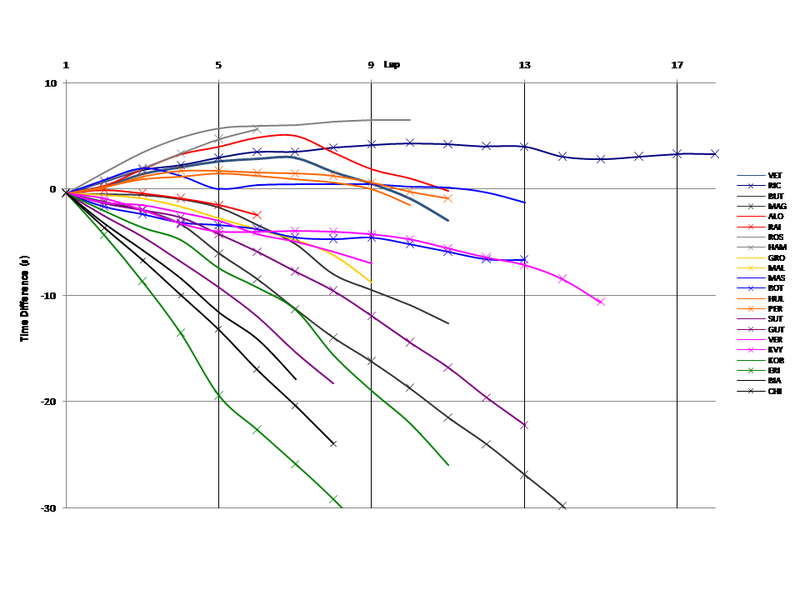 The chart of the main stints is given below – note that Rosberg is on softs and Hamilton mediums. Mercedes again fastest, but they don’t look so good on the softer tyre – where Ricciardo clearly did very well. This suggests that the choice is a two stop with the prime as the main tyre, or a three stop where the option might be usable as the main tyre – at least for two stints. From the Mercedes runs, the soft seems to be about 0.4s quicker over a few laps, but doesn’t last long. Rosberg’s pace changes at about lap 5, by about 1.2s. Fuel or tyres? Similar behaviour is seen from Alonso, but as Raikkonen is much slower (1.5s! ), and then his stint reverts to Raikkonen pace, it is unlikely that this pace is real. It might be better than Bahrain, but both Force India and Williams (at least Massa) seem to be ahead of Ferrari, who may be battling with McLaren. Toro Rosso again look to be close to this battle, as does Grosjean. There is strong evidence of some progress in sorting the Lotus, and strong evidence that Kvyat is a serious talent – he is beginning to look like the quicker Toro Rosso driver already and I was never convinced that Ricciardo was faster than Vergne. Sauber are still adrift, but a promising stint from Kobayashi suggests that Caterham are looking reasonable. So most likely it will be Mercedes, but they might have to do some looking after of their tyres, which would make it closer. Ricciardo is the most likely to benefit. There are three others I will be watching closely based on their performances today – Massa, Kvyat and Grosjean. They could all produce something based on the job they did in the long runs in Friday practice. I have used the second part of Hamilton’s run – the first part does not have enough quick laps. The converse is true for Rosberg, so I took his first stint. So I think I’m OK for the Mercedes. So from your analysis, fuel saving did play a part on races. No wonder Mercedes was so angry with Red Bull because they had to appeal to gain advantage. Fuel efficiency is a big player. The tighter the fuel, the better (relatively) for the Mercedes engines, and especially Williams. Or so it looks so far. Can someone please explain to me what do you mean by 100kg/hr. I do understand that the fuel limit is 100kg for the entire race. Correct me if I am wrong. But I don’t quite understand what do you mean by 100kg/hr? Ltn50, there are two fuel limits: a 100kg total per race, and an instantaneous limit of 100kg/hr (easier to think of it as 27.8 grams per second). The latter basically establishes a limit on short-term power bursts. With turbocharged engines you can make huge amounts of power on demand (with extra boost, fuel, and wear) – it would dwarf the effects of DRS and ERS, and turn the race into strategic use of massive power with fuel-saving mode the rest of the time. Your prediction was right again. Thanks, good you are back again. About the race incredible Hamilton was driving an 1.42.5 in the second lap. He must have been really cruising this race and looking at all the flags waving at him especially the black white ones. And I think it was a very good strategy from Alonso. He won about 6 seconds by stopping early the first stint. Strange race form Vettel. He was driving the same laptimes in the final stint as in the first rounds. massive fuel saving? May be you can explain a bit. I miss your analysis, mate! Hope everything is going well, and you’re enjoying the season – cheers. Hope everything is alright and you haven’t given up on Intelligent F1. We really miss the analysis. Ouch, what about williams !!!!!! miss u a lot right know. Anyway hope u are ok.
Just let us know your allright. Had everything crossed that you might of found a some spare time to do the Friday analysis from the German GP. Hope all is ok! really missing analysis you produce. Keep visiting this site in hope that you have found time to carry on and enlighten us all as to what is really going on…. Anyone here know if any similar type of website? Really hope you find the time to get this back up and running! Sorry to hear nothing from you anymore. Please let us know you are allright mate and let us say goodbye. Please consider starting this up again if at all possible!! !